In this video the photographer was panning the camera to follow the motion of the snowboarder. I used ICE to indicate “Start” and “End” points, and I gave a few hints about which video frames w ere interesting. The motion tracking and final composition was then done automatically by ICE. You can access this feature by selecting “New Video Panorama” from the File menu. 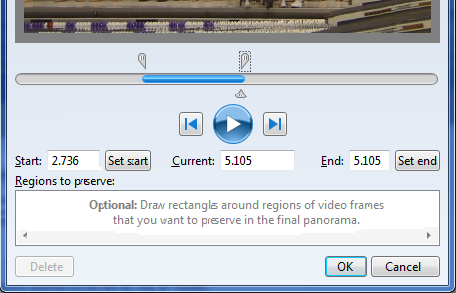 This will bring up the Video Panorama dialog (shown to the right), where you can play or single-step through videos in order to choose start and end points. You can also optionally draw regions of interest on individual video frames to ensure that certain elements are present in the final composition. ICE supports most common video formats (avi, mov, wmv, and more). Of course the results can also be uploaded to Photosynth. Note that this particular feature is only available for ICE running on Windows 7 (for other versions of Windows this menu item will be disabled). Video is also a great way to quickly capture a panoramic scene. For example, here a two-minute video was automatically turned into a panorama (this was shot with a Samsung Focus Windows Phone). Lens vignetting is the effect of the center of a photograph being brighter than the periphery. 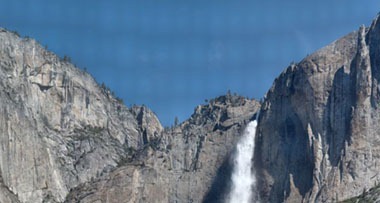 This effect can be especially apparent when stitching photos. For example, notice the repetitive pattern in the sky in the above panorama. This is caused by lens vignetting in the constituent images. In this ICE update, lens vignetting is automatically detected and removed. The result is shown below. The new version of ICE has a new blending engine. Previous versions did blending by applying a color adjustment to the panorama source images such that there would be minimal visible differences between them. In some cases, this strategy couldn’t adequately hide the seams. For example, in the panorama below, the seam in the moving water could not be completely hidden by color adjustment alone. In the new version of ICE we still run the color adjustment step, but where this is inadequate, we also do an intelligent fade between the images. This helps a lot in cases like the one below as can be seen in the two breakout panes. Click on the image below to explore it in full resolution on the Photosynth website; you should find it very difficult to discover the seams between images. Great.. The feature that I was waiting for has atlast arrived. Will write on this in my blog. The latest Version 1.4.2 not works under Windows XP SP3. opens. Are Windows xp never supported with this Version? We have tested this under XP. So, it should work. Nice! I used ICE for some years now. Nice to see, there is still development going on on this really handy tool! Noting change i am not able to start ICE 1.4.2. Version 1.3.5 works. maybe this cause the Problem. Man, that video feature is so cool! I’ll try it ASAP! Good luck. Please do let us know how your search for a paid tool turns out. There are many paid tools that work fairly fast, support Video AND work with WinXP (which I have no doubt that MS will no longer support). I’ll play with it a bit more but likely will be looking elsewhere (esp. for one that supports Video on WinXP). I used VDub to convert my Video to images to bypass that issue. Use VDub to convert your Video to Images. Try Hugin on it: http://sourceforge.net/projects/hugin/files/hugin/hugin-2014.0/ — it is not super fast but it is open-source (so you can help speed it up or otherwise fix it if you wish). Bing/Google for more Tools, there are a lot of them, this took me 5 min. to find. Just downloaded 1.4.3, but when I open ICE, the option for new panorama from Video File is greyed out. Found the answer in the Forum, the feature is only supported on Windows 7 not XP. 1) Is there a complete list of video containers and codecs which ICE supports? 2) If a user has installed third party codecs, will ICE be able to use them to decode more rare formats? There is a plugable codec capability in Media Foundation but I’m not aware of any 3rd part codecs at this point, that’s not to say they won’t exist in the future. Hi I installed new version on my win7 and the program not starting! I see ICE process few seconds in Task Menager and he is gone… Any solution? It’s the best panorama software ever!! I home it will be still updated!! This is a great piece of software. Any chance of supporting non-rectilinear source video in the future? Spinning around a fisheye lens/gopro and then being able to make a photosphere would be really cool! That is definitely on our list. We are progressing fish eye GoPro videos aa part of the Microsoft Hyperlapse work, so would be great to bring that to ICE.